The C110 Chad Los Banos Lava is a collaboration model introduced in 2006 and discontinued in 2009. The C110 was selected to be the Spyderco 2006 Forum Knife. "During work hours Chad Los Banos is a Corrections Officer on Hawaii’s Big Island. On his free time he is a hobbyist who practices martial arts and collects knives. In both his job and on his free time he handles knives, lots of them in all shapes and sizes. This motivated him to develop his own knife design he calls the Lava. The Lava’s form follows function approach piqued Spyderco’s interest and a collaborative knife design was the result. The Spyderco/Los Banos Lava has a long curving handle paired with a short blade. The blade’s cutting edge drops downward creating a negative blade angle, a positive feature when holding the knife. The negative angle positions the blade’s cutting edge lower than the user’s index finger so the wrist is in alignment. When the blade and wrist align, you can cut longer with less fatigue and better leverage. Chad’s design philosophy was not to force the hand to fit the knife, but have the knife conform to the hand- any sized hand be it large or small. He kept the blade under two inches and Spyderco manufactures it in VG-10 stainless steel, PlainEdged and flat-ground. The stainless steel handle curves ergonomically with a cutaway finger choil, pronounced enough to seriously wrap a hand around and solidly grip. A backlock with a Boye safety dent, locks the blade open and a steel pocket clip positions the (closed) knife, tip facing upward, in the pocket." All are made in Seki-City, Japan and have a mid-positioned Back Lock with Boye dent on the lock bar lever. 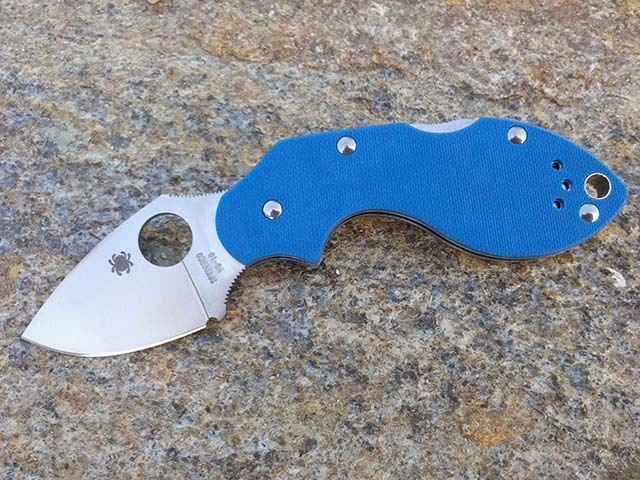 The Spyderco Forum model is believed to be the most collectible. This page was last modified on 14 November 2016, at 02:11.